*BRAND NEW* Panasonic PV-V4523S VHS VCR. Never opened still sealed and in factory packaging. Scratches do exist on player, remote, and manual. Item has been tested and runs correctly. Tested working, includes remote, manual, and AV cables. JVC HM-DH40000U D-VHS HDTV VCR Digital Video Recorder w/Remote. Another of my listings that I used 2 years ago for video transfer. Shipped with USPS Priority Mail. Sony SL-HF840D - Super Beta Hi-Fi - Betamax VCR Player/Recorder - Fully Tested plays and records Betamax tapes with no issue! New Factory Sealed Blank Sony Betamax Tape and 12’ video /audio cables included. Here is a Sony Video Cassette Recorder SVO-2100 SVHS Recorder/Player. Looks good, powers on. The tape begins to move then stops. As such, it is being sold As Is, for Parts or Repair..
Model: LSSQ0206. This VCR works amazing! 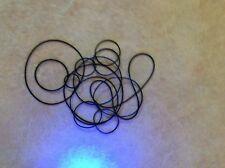 Hard to find bundle. Body is in good condition considering age of unit. Plays and records to VHS. VHS tapes inserts and ejects nicely. All functions on front panel work. SONY SLV-N51 4-HEAD VHS VCR Video Cassette Recorder w Cables Remote ~ IT WORKS!! Item is in EXCELLENT condition, tested and works great! Includes Flash Rewind "technology"! VCR has very light wear (mainly a few marks upper top left, which is really nothing)---and light areas of dust that a cotton swab can remove! Sony SLV-780HF VCR Video Cassette Recorder VHS Player Tested Works Free Shipping. Shipped with USPS Priority Mail. Item model number. Product information. This unit is clean and in good condition. Tested and fully functional. This deck worked well for several months but it no longer will play a tape. I opened the top and it looks like the main drum isn't turning. I've read many different potential causes including blown fuses. This baby was tested and works great with working remote (batteries included!). Just watched Forrest Gump on this and it worked beautifully! What a gorgeous wood grain look. This VCR was manufactured in 1988 up to 1990. The MV5100 features advanced Super VHS ET (Expansion Technology) to record high-resolution S-VHS video using standard VHS video cassettes - which are less expensive and more readily available than S-VHS tape. Magnavox 4 Head HQ VCR / VHS Player. 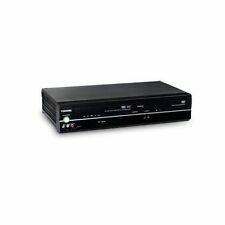 Model VR3440 VCR only, no remote. The remote is and AV cables are included. The Samsung SV-5000W four-head hi-fi incorporates a patented, long-life Diamond Head video system for optimum recording and playback. Six-language onscreen programming (English, Spanish, French, German, Japanese, and Italian) simplifies the setup and recording process. This has been tested and is working perfectly. 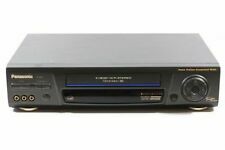 Go-Video DDV3110 Dual Deck 2-Head Hi-Fi VCR Up for Sale is a pre-owned “Go-Video DVD/VCR Dual Decker.”. Front and back composite audio/video inputs. Only what is pictured is what is included. PROFESSIONAL VIDEO CASSETTE RECORDER. PANASONIC AG-7750. Seems many are not finding the choices. POWER CORD NOT INCLUDED. Was told it worked when taken out of service. For sale is a Magnavox MVR650 VCR Video Cassette Player/Recorder. New in open box. Components have not been taken out of plastic. 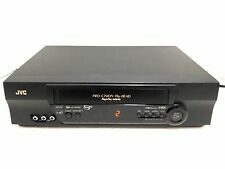 This is a JVC super VHS (S-VHS) VCR model: HR-S7900U. Shuttle Plus on Remote Jog/Advanced Jog Dial on VCR. High resolution Super VHS and VHS. Super VHS ET Recording. It's is in good condition with only minor scuffs on the top. Sony Betamax VideoCassette Recorder Model SL-5101 with Box No Remote Works. Untested didnt have a tape to test it powers up as seen in photo. Original Box! Condition is Used. Shipped with USPS Parcel Select Ground. This VHS player has been tested and work. Is is in very good physical condition as it only shows a few minor scratches/marks. Unit works great and has been fully tested and played a 2 hour VHS movie all the way through with no issues. This VCR comes with a pair of AV cables so you’ll be ready to hook this up right away. No remote control is included. The remote is not required for use unless you plan on using this VCR to record TV shows in which case you will need the remote which runs about $8-12 on here. Thanks for looking! What you see in the photos is EXACTLY what you are getting. See condition notes! New never used! Continental US. WHY BUY FROM US?. 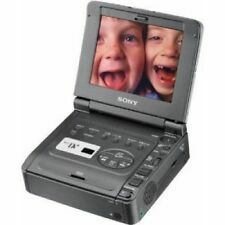 The Sony GV-D200 is an ultra portable VCR for recording and playing Digital-8 format videocassette tapes. Audio recording system: 12/16 bit PCM stereo digital audio. 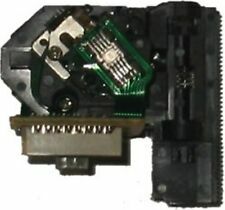 Composite ports allow tapes to be viewed on any TV. Toshiba VHS Cassette Player Recorder. Model M-752 Pro Drum V3. Includes remote shown (no batteries included) - see pic 6. The VCR is in great shape and the picture is clear. JVC HR-S3600 Super-VHS VCR remote. Remote is included. RCA VR451 4-Head VHS VCR Vintage - Works Great. Only one owner! Model, DDV3110. The inside of this unit is 100% dust free as it is new. This sale includes the GO- VIDEO VHS player/recorder itself. Many low-cost universal remotes can be paired with this unit. Sold As-is for parts or repair. Lower panel does not stay up. Following are my notes on operation. Audio is present on the tape I tested with. No video, just snow. Includes remote. This depends on location and variances in rates. This VCR was tested and worked Great All Around! We wiped it down, but you may find a little in the corners. JVC Model HR-VP780U. Video Cassette Player & Recorder. The Samsung SV-5000W four-head hi-fi incorporates a patented, long-life Diamond Head video system for optimum recording and playback. Digital special effects enhance your favorite recorded programs. Finding the right player to view your classic collection of films and TV shows can be an exciting hunt, since they are no longer the main method of video play. 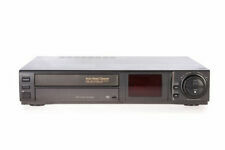 There are many models and brands of home VCRs available, in new and used condition, on eBay. How does a VCR player work? VHS cassettes get inserted into the player to view a movie on a connected TV. Blank cassettes can also be used on some VCRs to record video as well. VCR players work with VHS cassettes to play videos on your TV. The cassettes that you purchase for your VCR have video and audio signals stored on plastic magnetic film. The tape is wrapped around two reels and gets fed through a drum inside the VCR, which in turn translates the information into the film that you will see on the TV. What features do VCRs have? Stereo outputs: Connect your VCR to your home theater audio system for movie theater sound. Recording capabilities: Record television with the push of a button or schedule a time to start recording while you are away. Reel-to-reel recording: Some VCRs will have two slots to allow you to copy one tape onto another. Remote control: Stay in your seat and run your VCR by remote. Off-channel recording: Watch one television channel while recording the show that is playing on another channel entirely. What types of VCR are available? Two main formats of VCR exist, VHS and Betamax. Of the two, VHS is the more common type. When both types of machine were introduced in the 1970s, the Betamax had a slightly higher resolution than the VHS. Betamax tapes were also slightly shorter in width, making the machine a more compact way to play movies. Betamax was owned exclusively by Sony while JVC, the creator of VHS, was willing to license the technology to any interested company. This made access to the VHS machine significantly greater and therefore the more common option. When movies came out on VCR tape, Betamax was not a viable format due to Sony's decision to limit the recording capabilities of the tapes to one hour or less. This again helped to secure the market for VHS, and by 1980 it became the only available format on the market.